The Vatican has announced that during the Year for Priests, which will run June 19, 2009 – June 19, 2010, the Pope Benedict will grant plenary indulgences to priests and the faithful. The year will begin with the Solemnity of the Sacred Heart of Jesus, “a day of priestly sanctification,” according to a press release from the Vatican. 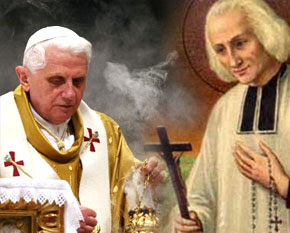 On that day, the Holy Father “will celebrate Vespers before relics” of St. Jean Marie Vianney, patron saint of priests.The Year will end in St. Peter's Square, in the presence of priests from all over the world "who will renew their faithfulness to Christ and their bonds of fraternity. (B) All truly penitent Christian faithful who, in church or oratory, devotedly attend Holy Mass and offer prayers to Jesus Christ, supreme and eternal Priest, for the priests of the Church, or perform any good work to sanctify and mold them to His Heart, are granted a Plenary Indulgence, on the condition that they have expiated their sins through Sacramental Confession and prayed in accordance with the intentions of the Supreme Pontiff. This may be done on the opening and closing days of the Year of Priests, on the 150th anniversary of the death of St. Jean Marie Vianney, on the first Thursday of the month, or on any other day established by the ordinaries of particular places for the good of the faithful.The elderly, the sick and all those who for any legitimate reason are unable to leave their homes, may still obtain a plenary indulgence if, with the soul completely removed from attachment to any form of sin and with the intention of observing, as soon as they can, the usual three conditions, "on the days concerned, they pray for the sanctification of priests and offer their sickness and suffering to God through Mary, Queen of the Apostles."